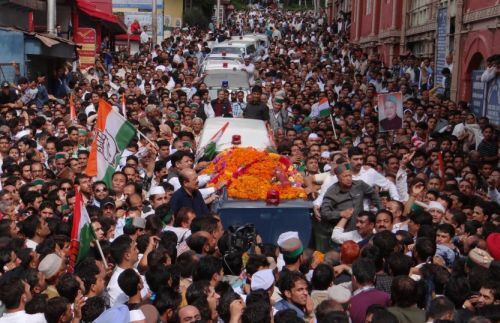 Opposition Congress put united show in its Shimla Rally, where its all big leaders participated and fuelled aggression in the Congress party that had been lying low in the wake of intra-party squabbles. Newly appointed State President Virbhadra Singh, CLP leader Vidya Stokes, party state in-charge Chaudhary Birender Singh and Kaul Singh Thakur addressed the rally near Central Telegraph Office and one after the other, lambasted at the BJP led Govt in the state. The leaders accused the BJP government of patronising corruption. The party office-bearers and legislators were also present at the rally. Earlier, Congress workers assembled at Mall near Indira Gandhi Khel Parisar and marched towards Vidhan Sabha through lower Bazzar road. Rally reassembled near Central Telegraph Office where Congress leaders addressed thousands of its workers. 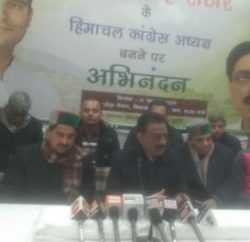 CLP leader Vidya Stokes hailed united show of the party leaders and workers and claimed that under the leadership of Virbhadra Singh Congress will throw corrupt BJP out from the power in the state. She targeted BJP Govt and said that Dhumal Govt was most corrupt Govt in state and urged party workers in unison to defeat the BJP in the coming poll. Former Congress state president Kaul Singh Thakur congratulated Virbhadra Singh for his appointment as party president and assured him for the all possible help in the party affair. He said that in the forthcoming poll, state Congress will work as a team and will defeat BJP. 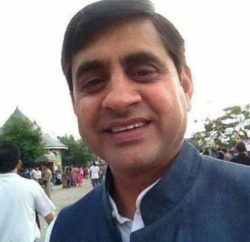 Congress party in-charge Chaudhary Birender Singh blamed BJP for corruption and stated that Dhumal led Govt has sold Himachal to outsiders. He added that in the campaign Congress will highlights the maladministration of BJP Govt. Chaudhary also detailed out its charges in the recently presented chargesheet. In his addressee five times Chief Minister and state Congress president Virbhadra Singh said that his priority is to fight the BJP and oust them from power as it has been the most corrupt government in North India. He said that he has been appointed president of state Congress fourth times and he knows his responsibilities and assured party high command and party workers about good in the coming election. He blamed the BJP government in Himachal with being “corrupt and added that in the coming time state congress will expose it. 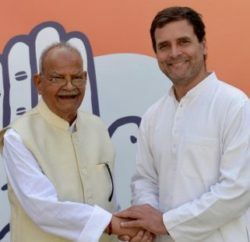 He also said that state Congress will request President Pranab Mukherjee to hand over the chargesheet presented to him by the state Congress against the Prem Kumar Dhumal government to the Home Ministry for a CBI probe. Lastly, he urged Congress supporters to maintain law and order and asked them to protest peacefully. However in the meanwhile, Youth Congress activists clashed with the police at AG office. Police used tear gas and water cannon to disperse the gathering. Six youth Congress activists injured in the scuffle and three of them sustained serious injuries and had to be hospitalized. Youth Congress activists blamed police personnel for working on the behest of BJP led Govt and claimed that they were protesting peacefully. Later Vikramaditya Singh and youth Congress president Monika Bharti addressed the youth activists and demanded inquiry into it and action against the police atrocity. Various leaders condemned the police action saying it was a mere excuse to attack protesters. On the other side, Police claimed that they used force only when situation went out of control after the demonstrators attempted to break the police barricades in a bid to march to the Vidhan Sabha that had been declared a prohibited area. Police claimed that they were using water cannons to disperse the crowd, but some protesters hurled stones at them. The police finally resorted to lathi charge and fired tear gas shells that left several persons injured. Arun Sharma, deputy commissioner Shimla. “The administration had permitted Congress to stage the demonstration at a given spot but they attempted to march towards the Vidhan Sabha,” whereas IG Police AP Siddique said that police did not intend to harm anybody, but were bound to protect the Vidhan Sabha.